Ahoy! It be Talk Like A Pirate Day, bucko. Alas, I noticed no local festivity to make your Roger jolly. It shouldn't stop you from sprinkling conversations with piratey vocab. "Give Me a Shot of Anything: House Calls to the Homeless" w/ "The Hub"
As usual, the lineup is a mix of films that might hit the independent theaters in the next year and films that have Boston ties. You may even recognize some faces in the preceding short film since it was also filmed around the "Hub". You could watch "Cold Mountain" at the BPL, but wouldn't you like to take a chance? Cutting-edge culinary is exploding in Spain. Ferran Adria has brought chemistry to haute cuisine as well as other Spanish chefs, and I see a lot of big-time chefs getting inspiration from the Iberian peninsula. Ramon Morató runs a chocolate school and has published a 600-page book on the dark, sweet ingredient. When you live in Belmont, it must be easy to hit almost every bookstore in the area. I keep listing Tom Perrotta's because, I've enjoyed a couple of his books, and a couple have been adapted into films ("Election", "Little Children"). Remember the warnings of the Rapture that didn't happen a couple months ago? The novel takes place in a world where something like that occurred. You may think you know this show inside and out, but you're not alone. Perhaps the most ridiculous comedy on TV will be the subject of every pub trivia question. Every player chips in $5 (maximum 6 per team), and the winners get the cash. There is usually prizes for second and third places. 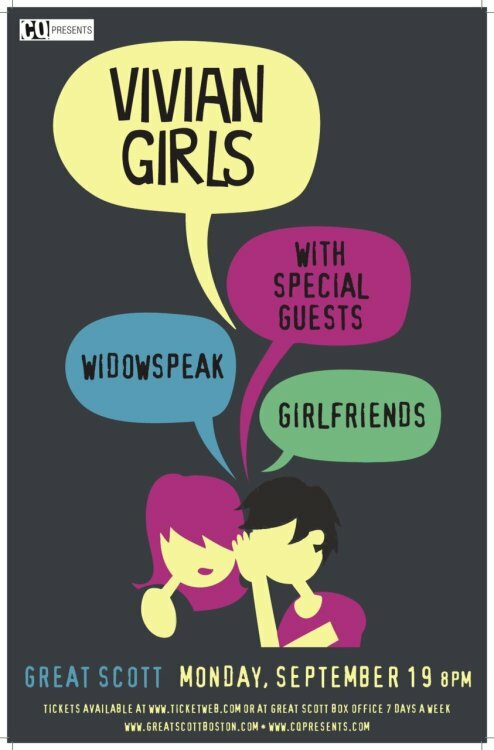 It's easy to hit music sites, and find many raves for Vivian Girls -- like I rave about Girlfriends. I'm not alone in adoring their nearly-perfect fuzzy garage-pop out in the blogosphere. Both are cool bands that know how to keep it loose yet catchy. It sounds like Widowspeak keeps it laid-back without putting you to sleep.